When Final Destination was released in 2000, it had cleverness on its side. After years of slasher films that found increasingly tortured origins for their kill-crazy villains, director James Wong (along with writer Glen Morgan) simply did away with the slasher altogether by making death itself the villain. It wasn’t a great movie, but it was a neat twist on a horror staple. Then came installments two (directed by David E. Ellis in 2003) and three (directed by Wong in 2006), which both found the perfect realization of the concept. All three films start with a catastrophic accident (plane crash, highway pileup, rollercoaster derailment) before doubling back to find that a character has had a vision of that accident, which allows for some preventative measures that allow some of the would-be victims to move away from the inevitable. But they were supposed to die, so death (an unstoppable and unseen force) hunts them down. The second and third movies still weren’t great, but they were better than their franchise’s originator in the way they let their slow building dread of death creep up on the characters. All three films successfully turn everyday objects and situations into (increasingly inventive) Rube Goldberg death traps allowing the fear to come not from what’s hiding in the next shadow but from eying all of the objects in the frame with a newfound suspicion. So here we are with a fourth installment, confusingly titled The Final Destination and back with David E. Ellis directing. This time it’s in (mostly pointless, save for the opening sequence) 3D, but that’s just about the extent of the innovation on display this time around. The opening accident is not quite as sensational. The death traps are not as creatively elaborate. (What used to take several steps in a chain of events now tops out at three or four). The characters are not as relatable or dimensional (not that dimension was ever a major strength of the characters in this franchise), instead they’re uniformly cartoons. Our main characters are the most relatable, but even then, they’re thinly drawn. Bobby Campo plays the one with the vision and does a reasonable job shouldering that burden, though, like every aspect of the movie, he’s not quite as good as those who’ve come before. He has some friends (Shantel VanSanten, Nick Zano, Haley Webb) and they all seem like they’re in their early-to-mid twenties but I’m not sure what they do. There’s a cryptic reference to studying in the opening scene but the rest of the film finds them only interacting with each other and others on death’s list or lounging (and fretting) around a well-furnished domicile. Where do they get their money? Are they still in school? Are they working? Where are their parents? For that matter, where does this movie take place? No one in this movie has much of a life outside of the plot, whereas in the other movies there were other characters or props that could show us that the world existed before and after the film. Here, the characters seem to only know each other in their bland generalized Hollywood town. This is a hermetically sealed death-machine with a mostly pretty cast sent to die. The movie is reasonably diverting, though, moving right along. It’s short and barley leaves an impression. I certainly didn’t have an unenjoyable time, but it never truly delights or unsettles in the ways that its predecessors have. The most interesting moment has a (spoiler) movie theater showing a 3D movie strafed with debris from a nearby construction site. Save for this brief shimmering meta-moment, the movie just doesn’t have the creativity to fulfill its concept. With this fourth installment, what started out as a great twist on a tired genre has itself become tired. 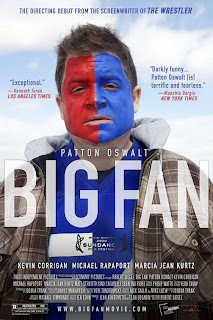 In Big Fan, Patton Oswalt inhabits Paul Aufiero, a painfully realistic character, a needy, dead-end man who latches onto his small nugget of fame as he calls in nightly to a sports talk-radio show to display his fandom of the New York Giants to the region by way of his angst-filled pep-talk monologues which he endlessly writes and rewrites all day as he sits at his job in a parking garage. He’s going nowhere fast, but he barely has time to notice as long as he can keep things all Giants, all the time. It would be a shame to reveal too much about what happens to this character. Shame is exactly what the editors of the trailer and the writers of the official studio synopsis should feel, for revealing is precisely what they did. It’s far better to merely describe the characters, rather than risk betraying the small (near) perfection to be found in the structure of the story created by writer-director Robert Siegel (he previously wrote the screenplay to last year’s most excellent The Wrestler). Needless to say, Paul’s fandom becomes a problem. After our slow introduction to the world of the character, there is a sequence of slow-building suspense that ratchets higher and higher as Paul’s fandom causes him to become the victim of a crime. The sequence is superb, closing out the first act with a shock. The second act, however, spins its wheels. The irony, played for both humor and pathos, is that the Giant’s chances of winning the season are now actually in Paul’s hands, but once that is established, and wrung out of its usefulness, the characters continue to fret about what will happen. As interesting as it is that Paul becomes more aware of reality at the same time his fantasy comes true, it’s a great relief when the third act kicks in. The actions Paul begins to take are kept hidden for some time. Half-glimpsed at the margins of the frame are props which give us clues. Mirroring the first act, the third act is a great showy sequence of slow-building dread mixed with sick suspense. The release of this tension – the punchline, if you will – is one of the biggest rushes of satisfaction I’ve had from any film so far this year. The film is two perfect sequences sandwiching a flabby midsection, but even when it’s stalling, I was never outside of the film. Paul is a compelling character, a believable character, and I cared what would happen to him, I cared about the other characters in his world, I cared about what he would decide to do next. This is a comedy, sure, but it’s also an affecting character study. It’s not as good as The Wrestler, but Siegel has crafted another interesting, memorable character (though he’s no Randy “the Ram”) and a fairly good movie in which to house him. 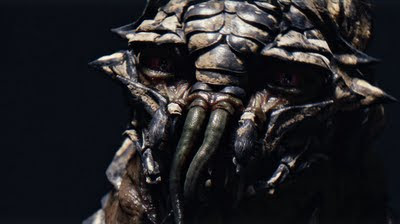 District 9 takes off like a bullet, blasting its opening scenes at the audience with a terrifying speed, quickly overwhelming (but not frustrating) with new information. It opens as a documentary, showing us how, twenty years ago, a massive spaceship stopped over Johannesburg and wouldn’t move. Eventually, a hole was cut in the side, allowing the world to discover, and remove, sickly menial workers of an alien race – quickly nicknamed Prawns – the leaders already dead from disease. 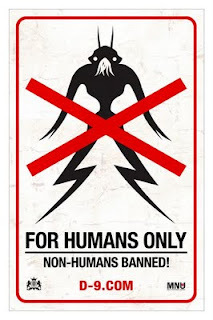 The aliens are shuffled off into a ghetto called District 9 where they can coexist without mingling with the humans. The immigration and racism allegories that can, and have, been used for aliens in the past, are joined here by an apartheid allegory, made all the more vivid by its South African setting (a place that really had a District 6), is interesting and nuanced. It makes feelings of revulsion towards the “other” understandable with the ugly design of the aliens (I was revolted by them at some points). What a thrilling opening to the film, a science fiction film with real brains and a fully realized world. Our main character is Wikus Van De Merwe (Sharlto Copley, first-time actor), a bureaucrat assigned to evict the Prawns from District 9 and order them moved to District 10. He bumbles along, cheerfully carrying out said job, jesting with the men working with him and playing things up for the documentary cameras. But, as often happens in these kinds of movies, something goes wrong. Wikus makes a critical mistake and consequentially finds himself falling into a bottomless pit of problems. There are scenes of great bodily horror and gross-out gags. The editing grows more frantic, the cinematography nightmarish. The good mockumentary turns into an equally good horror-mockumentary hybrid. But then, a mistake is made. Writer-director Neill Blomkamp drops the mockumentary aspect altogether and turns the movie into a straight-up sci-fi actioner. The movie works fairly well as an actioner, and the massive set-piece of discharging weaponry that closes the film is impressive, but it’s jarring to have a fairly typical documentary style film throw in a scene that no documentary filmmaker could have captured and then drop the conceit entirely. But if that were the only problem with the last act of the film, this would still be a very good movie. The problem is it’s not the only problem. Wikus takes a series of actions, late in the film, that make little sense given what we’ve seen up to that point. (I’m sure many of you have seen it by now, but I’ll dance around the spoilers anyways). He very quickly turns on a character because he disagrees with the time a plan would take, despite the fact that this other character is the only person who could help him. Just a handful of scenes later, Wikus is helping the other character again. These changes are nothing more than a plot gimmick, a false and forced beat of drama that provides yet another hiccup in the transition from doc to schlock. Both halves are good, but the first half is more successful at its goals than the second half. But, these quibbles aside, the movie is still impressive, still entertaining, and still good. The special effects are fantastic, stunningly integrated into the live-action material. Sharlto Copley is equally fantastic, especially considering that it’s his screen debut. There are still brains behind the concept, even though it gets harder to see them as the film goes on. There’s great intense energy and propulsion to the film – it only slows down a little in the middle – that creates a visceral series of thrills. It’s a thrill-ride of a movie. It’s not perfect – I won’t be one of those people over-praising it – but in a summer starved for thrill rides, this will do just fine. I'm sure all of you would love to read what I think about District 9, Big Fan, and The Final Destination - and I would love to finish the reviews I have half-written for them - but I just can't get Inglourious Basterds out of my head. I knew there was only one solution to this problem, so I saw the movie again. It's even better the second time around. I can tell that this will be the kind of film that will increase enjoyment because of the known experience, gaining a richness through repetition, an even greater greatness through familiarity. During the second viewing, tension was joined by anticipation. Not only was I still nervous about character's fates, but I was anticipating lines, shots, scenes, set-pieces, and music cues with giddy delight. I nearly laughed out loud at how much fun I was having. This is a great movie. With so much to praise, and so much to contemplate (take a look at the spoiler-heavy epic conversation hosted by Dennis Cozzalio), it's not strange that one of its greatest attributes is quite simply that it is an incredibly fun movie. It's also not strange to discover that I left out some praise in my initial review. I was shocked to discover that I barely mentioned the character played by Michael Fassbender, and neglected to mention his name. He's great; a charming and cool critic, as Archie Hicox, he's instantly one of my all-time favorite screen portrayals of the profession, right up there next to Addison DeWitt and Anton Ego. I was also shocked I failed to mention characters played by Daniel Bruhl and Jacky Ido. As a German war hero and a French projectionist, respectively, they don't have large parts in the film but their performances are wonderful, and their relationships with Soshanna are important to her behavior. Also doing good work with small roles - as mostly silent Basterds - are Til Schweiger (HUGO STIGLITZ! ), Omar Doom, and B.J. Novak. This is a great movie. I already want to see it again, but now my head is clearer and I can move on to the other reviews. I (probably) won't get sidetracked again, and I definitely don't want to get further behind in my posting, but no promises. As a certain Basterd said so well, "Arrivederci!" Update (9/2/09): In this post, I singled out actors for praise that I neglected to give in my initial post on the film. Today, I am struck by my neglect (twice over) to mention August Diehl, who is excellent playing a Nazi officer who is a large part in the third chapter's now-famous bar scene. My apologies to Mr. Diehl.